Hello all! If you have some of the same first world problems as myself then you will agree that removing mascara is the bane of your life. I use Clinique mascara (any one, I’m not fussy) and while it looks amazing on my eyes, it is very, very, difficult to remove. In fact, the only thing that could remove it was the Clinique eye make-up remover which at a price tag of about €15 is not exactly good for my pocket. Fear not though, I won’t be bankrupt just yet because I have found two other options! The first is from Kiko (click the link if you are not familiar with this amazing company yet) and is a respectable €5 or thereabouts. 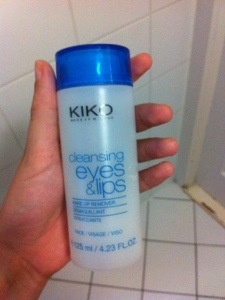 It works like dream and wipes the mascara right off, usually only needing about 2 wipes of the eye. Amazing I know! I was so chuffed to find this but another product has wiped its eye recently. Now I can’t actually take credit for this find because it was my sister who discovered it when she was here in Berlin. 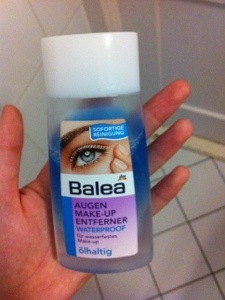 It is a remover from a German drugstore called DM. I know I am awful for reviewing Germn products when a lot of my readers are in Ireland and the UK but I have actually seen this on Amazon UK so if you really want to try it, it is accessible. This product works the exact same as the others mentioned. A pointless for me to include it then maybe but what makes this my favourite it that it is only €2.60! Can you believe €2.60 for a product that works exactly like one from Clinique. Yes, the bottle is a bit smaller but money-wise this really is the best option. Let me know in the comments section if you have any suggestions. I am a sucker for a good dupe!